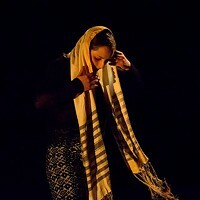 Just as food and music have created connections between cultures, dance, too, has bound one culture to another. In her latest work, Bamboula: Musicians’ Brew, for Denver-based Cleo Parker Robinson Dance, choreographer Millicent Johnnie explores the cross-cultural connections between the Zulu minstrel parades of New Orleans and the Minstrel Carnival in Cape Town, South Africa. The work headlines Cleo Parker Robinson Dance’s Pittsburgh debut, Feb. 19 and 20, at the Kelly-Strayhorn Theater. The work, commissioned by the Kelly-Strayhorn, had its soft premiere in September as part of Cleo Parker Robinson Dance’s 45th anniversary celebration, says Johnnie, speaking by phone from New Orleans. The premiere performances this weekend will cap Johnnie and the company’s 10-day residency at Kelly-Strayhorn to further develop the work. Set to traditional African music, and jazz music composed by Charles Vincent Burwell, arranged by Isaac Points and performed live, the 35-minute work is in many ways a sociological and anthropological study of the traditions of music, costuming, parading, blackface and “second-lining” found in New Orleans and Cape Town culture. “We’ve called the work Bamboula: Musicians’ Brew because of the connections to Africa made by vaudeville musicians that traveled from New Orleans to Cape Town in the early 1900s,” says Johnnie. Johnnie, who has also been tapped as a choreographer for Disney’s upcoming Frozen: The Musical, is one of many young choreographers the legendary Cleo Parker Robinson has fostered over the years. “I love that we are continuing a legacy of keeping alive the works of some of the greatest choreographers in the world, and that we are also nurturing the evolution of new ones,” says Parker Robinson by phone from Denver. 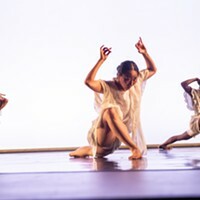 Also on the Feb. 19 and 20 program are choreographer David Rousséve’s heartfelt tribute to Parker Robinson’s parents, “Dry Each Other’s Tears in the Stillness of the Night” (1993), and Theo Jamison’s “Dance as Ritual” (2008), based on the dance technique of icon Katherine Dunham.